The 2012 Ancestor's Trail proved popular and educational for those who took part. MISSISSAUGA — If you have the grit to look your evolutionary past straight in the eye, you might want to try the Ancestor Trail this Sunday at Erindale Park. 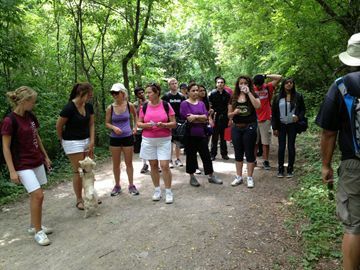 The walk goes from 8 a.m.-1 p.m. and follows 12.5 kilometres of the Culham Trail. Starting at Erindale Park, hikers will register and proceed on a pilgrimage to view our common ancestors, or concestors, over the past billion years. That means looking past cute primates with soulful eyes to creatures like bony fish and, a billion years further back still, multi-cell organisms. Designed by veterinarian Kevin Saldanha, the trail is set up so each human stride of 0.75 metres represents 60,000 years. A scant 6.25 centimetres represents 5,000 years of human civilization. The timeline is geological and the trail represents one billion years of evolutionary development. That takes the hiker back to multi-cell life forms on Earth. Not exactly creatures we identify with and certainly not cute or cuddly. "We treat animals differently based on their usefulness to us," said Saldanha. That doesn't mean we treat useful animals well. He cites the way cattle are de-horned and have their tails docked without anesthetic. At each milestone, hikers can read about the creature that is the concestor to all life on Earth. Turns out our ancestors aren't necessarily creatures that would frequent Creditview Animal and Bird Hospital, where Saldanha practices. It makes sense that humans have non-human and non-primate, and even non-mammal ancestors, but it's not something we usually consider. Keeping the scale constant means not a lot happens until 500 million years. That's when the hag fish shows up — probably not the kind of ancestor anyone brags about. It's an eel-shaped marine animal that produces slime — and the only living animal that has a skull, but no spine. Saldanha says once you recognize a fish as an ancestor, it's hard to feel comfortable about sport fishing. It's not until 300 million years ago that amphibians and reptiles show up — animals that continue to exist. "The trail changes your world view," said Saldanha. "It changes the way you look at other life forms when you identify with our evolutionary cousins." The experience highlights the importance of preserving biodiversity — a diversity of life forms that he says is being destroyed by humans changing the environment. This year Saldanha is requesting hikers donate or take pledges to offset the cost of organizing the Ancestor Trail. It's not necessary to walk the whole distance. On his website (www.ancestorstrail.ca), there's a full outline of the trail that shows when and where people can join the hike. In advance of the walk, there will be a presentation at the Mississauga Central Library about the Ancestor Trail and the book that inspired it, The Ancestor's Tale, by Richard Dawkins, on Saturday at 2 p.m.